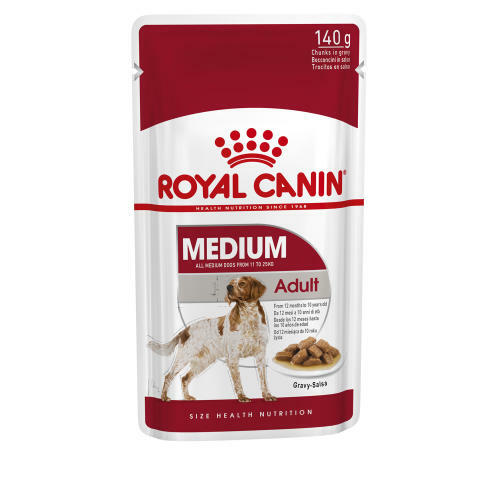 ROYAL CANIN Medium Adult Wet Dog Food Pouches in Gravy are sure to get tails wagging! This is complete wet food for adult medium breed dogs (from 11 to 25kg) from 12 months to 10 years old. Highly digestible, support for natural defences with added Omega 3: EPA and DHA for skin and coat. Composition: ash: 1.6%. Crude fibre: 1.1%. Crude oil fats: 5.5%. Moisture: 81%. Protein: 7.5%. Please see feeding guideline in image.